How Many Calories Do Doughnut Holes Have? Doughnuts aren't a particularly healthy treat, given their high sugar and fat content. Eating foods high in simple sugars, like doughnuts, may cause your blood sugar to rise and your body to store more calories as fat. Doughnut holes, with their smaller size, can be a better choice than whole doughnuts if you only eat one or two, and this will allow you to try a couple of different flavors without going overboard on calories for your snack. Cake doughnut fans should be aware that each unglazed cake-style doughnut hole has 59 calories, 3.3 grams of fat and 2.3 grams of sugars. A glazed, yeast-leavened doughnut isn't much better with 55 calories, 3 grams of fat and 3 grams of sugar. 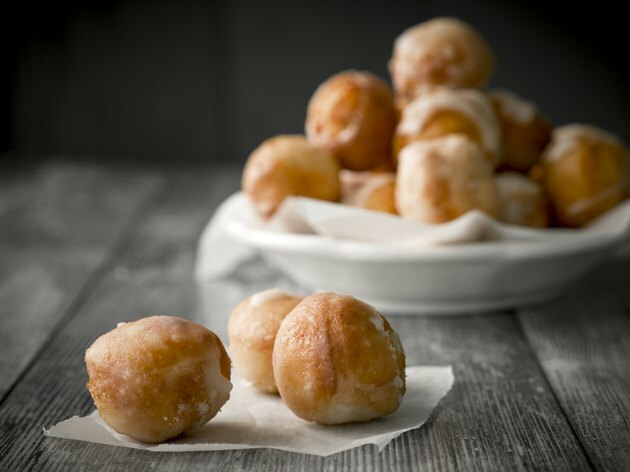 Glazed chocolate cake doughnut holes will be similar in calories, but the jelly-filled doughnut holes are slightly higher in calories than unfilled doughnut holes. While one doughnut hole isn't too bad, about four doughnut holes equals about one regular doughnut. A medium, 3 1/4-inch cake doughnut has 226 calories, 12.7 grams of fat and 8.8 grams of sugar. You'll be eating 20 percent of the daily value for fat and 19 percent of the DV for saturated fat, which is the type of fat that can increase your cholesterol and your risk for heart disease. This serving also contains about 35 percent of the American Heart Association's recommended daily consumption of added sugar for women and 23 percent of the recommended limit for men. AARP: Are All Calories Created Equal?